A Great Review for "Gambling on a Dream"
It was just before Christmas in 1955 when New Orleans sax man Sam Butera received a phone call at home. It was his old pal and occasional running mate Louis Prima on the line. Prima’s high-energy performances with Keely Smith had made them a must-see act on the Las Vegas Strip. But the act needed to kick it up a notch. Prima was calling that Christmas Eve with a request for Butera to hop on a flight to Vegas and let that tenor sax rip. Vegas would have to wait, but only until the day after Christmas. Butera’s decision helped define Las Vegas lounge culture forever. Available on Amazon, iTunes, and other sources as a download, the book includes rarely-seen photographs, interviews with Butera and many more great Las Vegas characters from the past, with nearly 40 videos. The design itself is a delight, but if you’re a lover of Las Vegas of a certain age, its the content that will make you want to jump and jive. 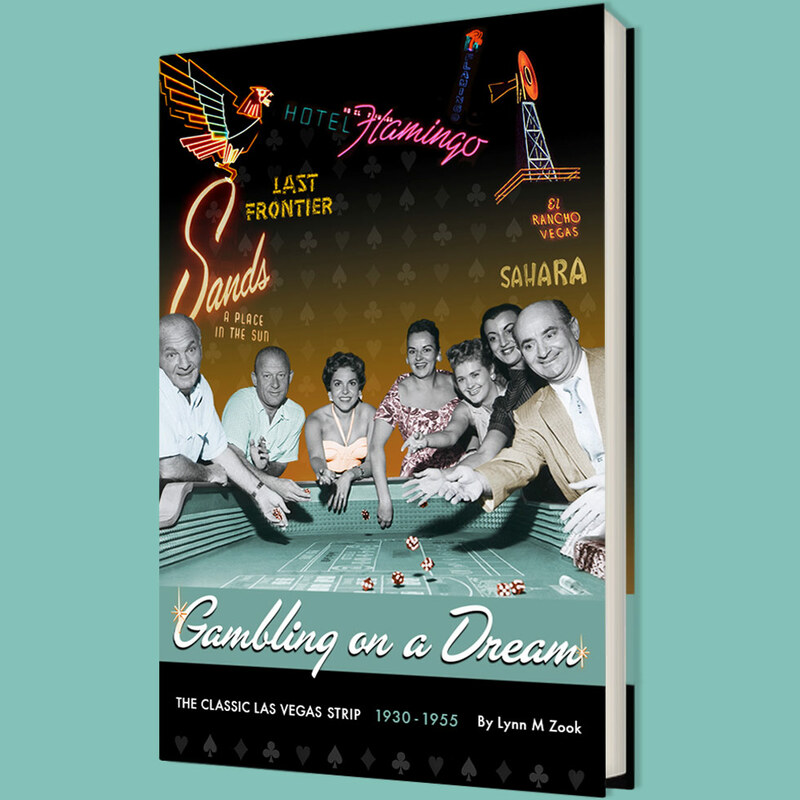 The book takes you through the histories of some of the most iconic hotel-casinos in the history of the Strip. They were gambling joints, sure, but between their entertainment policies and their flashy architecture the Boulevard’s best resorts dazzled hip and square alike, offering many dining experiences plus a party atmosphere 24 hours a day. If that pitch sounds a little like the way most Las Vegas resorts portray themselves in the modern era, it’s because it’s the undeniable formula for success. Check out the clubs and pools on the Strip today – the ones with the party atmosphere are anthills of activity. Only the hairstyles and tattoos have changed. Zook comes by her love of neon Las Vegas honestly. She moved with her family to Las Vegas on Labor Day in 1961. Her mother took a job as a showroom waitress — a great gig in that era — first in the Sky Room at the Desert Inn, then to the Sahara, and then over to the Stardust. When mom landed a coveted spot at the Circus Maximus at Caesars, it was one of the best duties on the Strip. And there were side benefits. With a parent working in close proximity to the stage, Lynn was able to see the Smothers Brothers, “Fiddler On the Roof,” “Mame,” “Sweet Charity,” and even Elvis. In the book, the El Rancho, Last Frontier, Flamingo, Thunderbird, and Sands are featured in fine style. And, yes, she’s already planning a followup that will highlight more resorts from the Las Vegas pantheon. The best way to familiarize yourself with Zook’s Las Vegas love affair is to go to her classiclasvegas.com site, where you’ll be reminded that her devotion is “part of a nearly two-decade long historical preservation project documenting the history of Las Vegas and the stories of the men and women who transformed it from a dusty railroad town into one of the most legendary cities ever built.” Her blog posts are fascinating. She left Las Vegas in 1977 to attend college in California, but “over the years, going back and forth visiting family I realized the city was changing rapidly and the town I’d grown up with was vanishing from the landscape. “I wanted to help preserve sort of as many of the stories as I could. Like Butera and Prima and all the other finger-snapping inhabitants of her new book, Lynn Zook doesn’t miss a beat.